The evergreen Interior Live Oak has a large, helmet like canopy and dense leaf foliage that make this oak a yearround shade tree. 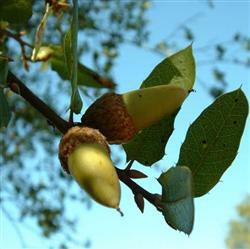 These oaks produce smaller, pointed acorns in the fall, providing wildlife with a plentiful winter harvest. The trees can reach great heights if near good water and provide many native species with shelter and food for years. Black Oak and Coast Live Oak frequently join this titan of the hills.